I have to admit that I’m easily distracted from writing. Usually it’s editing, I just can’t let go. And then there’s the mundane tasks of everyday life – cooking and cleaning (well perhaps more thinking about doing these things rather than the actual execution of them). In the evening I can be tempted away from the laptop by the promise of an action packed film, and as the cold nights draw in I’m partial to a bath, a book and an ice cream. Now I find myself with a whole new level of distraction. Poppy, the lunatic kitten has been with us 5 days and is taking over. As I type this she is stalking my fingers. And she keeps dashing across the keyboard so I constantly have to delete her additions to my work. This kitten needs a time out or a naughty step. 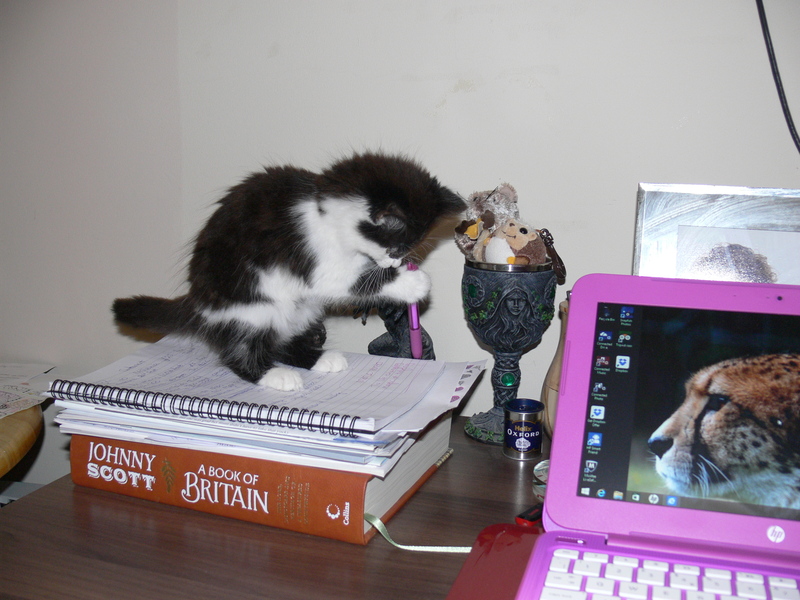 The final part of proofreading my novel has also been given the Poppy treatment – she’s either attacking the pages or stealing my pen. Maybe she thinks she can do a better job! At least the proofing is finally done; the read through part anyway. It turned into a bit of an editing exercise, I just can’t help myself. When I next get the chance, I shall make the final few changes to the novel. The word count will go down by at least a few hundred. It’s amazing how many small changes can be made, even after extensive editing by myself, beta reads by writing friends and professional editing. Now is the point where I have to call it a day. To finish it, before it finishes me. This novel has been a bit like a naughty child or kitten. It’s given me years of grief and sleepless nights, but it’s grown into something I’m proud of and I can’t wait to share it with the world, though I’m sure a lot more sleepless nights are still to follow. Poppy is finally asleep, so I guess it’s time to start tackling those changes. Thanks. It is a huge step to say that I’m proud of it, but the biggest step of all will be the day I finally get to hit publish and see it for sale on Kindle. It’s coming soon, I promise! If I can sort the book cover issues and work out the whole kindle conversion.